Fantastic, old school NFC Championship game, with a plethora of side stories and intriguing anecdotes. Green Bay has been doing things the hard way all season long so traveling to Soldier Field will not scare them unduly. They have beaten the Giants, Eagles and Falcons in recent weeks and look like a real force to be reckoned with. The offence is slinging the ball around with consummate ease, racking up points like Vince Wilfork gobbles up cheeseburgers. To add to that, the Packers boast the league's fifth-ranked defense and tied for second with 47 sack. Clay Matthews was fourth in the league with 13 ½ QB take downs. Many see the Bears succumbing to a bull-rush of Packer blitzers. Here’s the thing. Since week 7, when the Bears were just 4-3, Cutler and Co embarked on a sparkling 7-1 run which led to the NFC North championship and subsequent first-round bye. 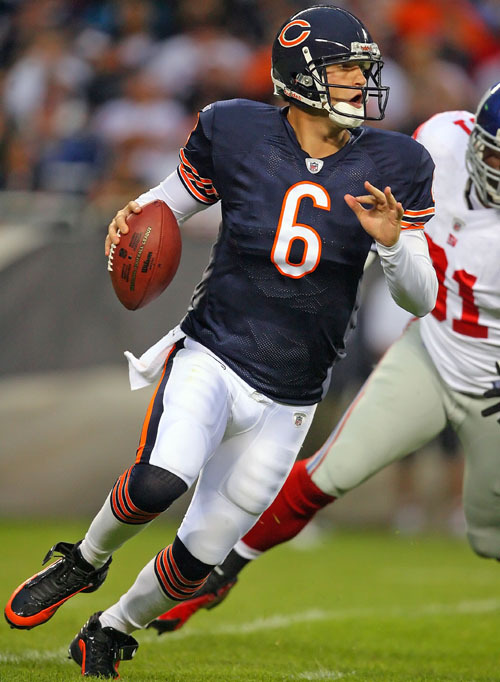 Much of the success came off the back of clever play calling from offensive guru Mike Martz, and excellent execution by Cutler and his bevy of speedy receivers. Not to mention Matt Forte. Martz and Cutler can come up with a game plan of 3-5 step drops, quick passes and chain moving plays to avoid the inevitable Packer rush. Two more big factors to talk about. The only glaring Achilles heel in this game is the Packers running game, or lack of it. They are going into this encounter with one of the worst running games in the NFL. The Bears will be able to sit back and play the pass, with very little effort required to stop the Packer running game. The Packers can do no such thing, they have to give Matt Forte his due respect, which opens up the field a little for Jay Cutler. Finally, the Bears special teams unit is one of the best in the NFL, in terms of both the return game and the coverage side of things. Devin Hester is keeping the Packers coaching team up late at night, as they try to think of ways to keep the football away from him. This has all the makings of a classic encounter. The Packers have played great football the last few weeks, however they may have just a few more question marks hanging over them in the form of that shoddy run game, and some awful early season losses. Chicago, at home, with so many weapons to play with, in a surprise shoot out.